The weather today was lovely, except for the hail storm. And the downpour in the final half hour. Really; the wind has dropped and for every glowering black cloud on the mountain, there is a sparkling, sunny valley. North of Inverness I expected a deserted wilderness, but we passed through several decent sized towns and the countryside was dotted with pastoral farms. Dingwall, Cromarty, lunch in Alness, and rolling through the rather posh-looking Tain, which we guessed was built on money from golf, before noticing the Glenmorangie distillery at the back end of town. 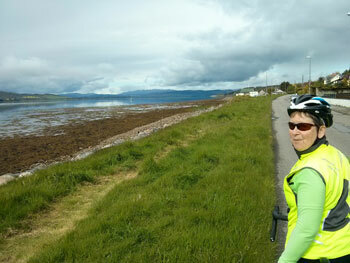 At last we reached the fringe of Dornoch Firth, a long stretch of water between striking multi-shaded hills, and at the end of it, Bonar Bridge, under its personal dark black cloudy downpour. If you wonder how we pass 6 hours a day in the saddle, here’s a taste. Caroline’s painstakingly-prepared routes, and finely-chosen accommodation have come up trumps again. So I decided she should be granted a lifetime achievement award, for services to holiday planning. Initially I imagined a photo-montage running as she climbs the steps at the ceremony; scenes roll-by: California 2001, the Spanish road trip of 2008…. But then… why not a full biopic? But who to cast? C opened with Anna Maxwell-Martin (which I thought a good choice) and I Jonny Lee Miller, but then the budget was raised and C would settle for no less than double Oscar winner Emma Thompson (notwithstanding differences in stature). Which left me no alternative than to choose Greg Wise, for the veracity of the love scenes. As for supporting cast, for memorable holidays in Costa Brava, Greece, etc, Susan Sarandon will play Yvonne, and Brian Cox (the grizzled Scottish actor, not the professor) takes the part of Tony. The most challenging casting decisions have been Tom and Clara. Whether to restrict to child stars (Emma Watson?) or imagine junior versions of adults (Audrey Hepburn!). Tom has so far completely escaped; any ideas?